There is no question that the Earth is changing and that humans are the ones responsible. In the age of the humans, or Anthropocene era, biodiversity has declined, CO2 levels have risen and climate change has the potential to have dire consequences. Research shows that coastal communities, especially small island countries are most at risk for these effects of climate change such as sea level rise and increased ocean acidity which can result in fishery decline. But, with the right management, these communities can soften the blow of climate change and keep their fisheries sustainable for future generations. 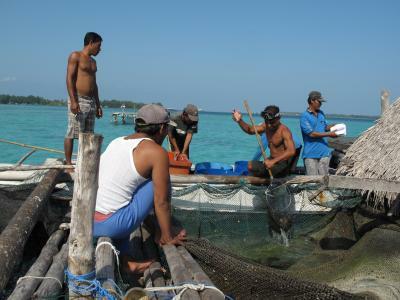 A new study by the Wildlife Conservation Society and the University of Western Australia shows that fishing communities in Indonesia have done just that, and their practices could serve as a potential model to other small island countries. By financing more ecotourism in Karimunjawa National Park, the government on Indonesia is trying to take pressure off the marine life by limiting fishing in spawning areas. Any businesses who aim to develop business enterprises to promote ecotourism in the mangrove-lined islands in the Java Sea just south of Borneo, are provided with incentives. While many communities around the world have similar policies, the concurrent problem has always been enforcement, and the usual excuse for lack of oversight has often been money. But, one of the studies authors, Dr. Caleb McClennen, said that the government and community working together has made this model work. The new study appears in Marine Policy and can perhaps serve as a preliminary model for other coastal communities. The authors include: Stuart J. Campbell, Tasrif Kartawijaya, Irfan Yulianto, and Rian Prasetia of the Wildlife Conservation Society; and Julian Clifton of the University of Western Australia.